Owner/Chef James A. Hendricks of Le Bistro Du Soleil presented this class. Jay, as he called, prepared a Potato-Onion Tart, a Beef Bourguignonne, and Chateaubriand with Shiitake Mushroom Rub. All three were variations of recipes from Williams-Sonoma recipe site. All of the recipes were great. The Potato-Onion Tart recipe made too much filling so you can increase the pastry or reduce the filling. 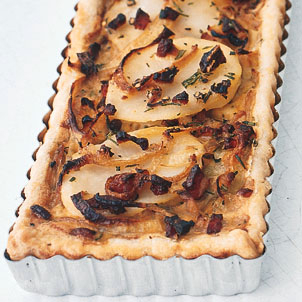 With more pastry, you can make a larger tart or two tart in the called for tart pan. 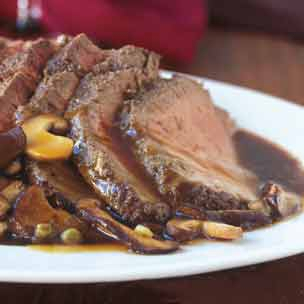 The Chateaubriand with Shiitake Mushroom Rub was made with filet to speed up the cooking time. 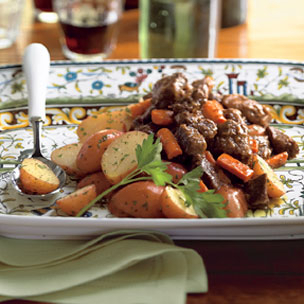 The Beef Bourguignonne made with T-bones to speed up the cooking time. Some items are copyrighted by Williams-Sonoma.